For the women of F&M Basketball, experience is a key strength. Especially when dealing with a treacherous regular season that consists of 25 games, the Diplomats will surely look towards their returning players for leadership. Coming back into the season with nine returners along with four new players, the Diplomats hope to improve their record from past seasons and earn a Centennial Conference playoff spot. The Diplomats started off the season on a positive note, winning three out of their five games in November including a dominating 72-57 opener against Immaculata and a closely fought 70-62 win against Elizabethtown. The team’s first Conference success came against Bryn Mawr on December 2 in a stunning 79-29 win. Senior Erica Brown led the Diplomats to victory by garnering a game high of 20 points. Despite some losses prior to the holiday break, the Diplomats picked up speed in the New Year, winning four games so far in the month of January. 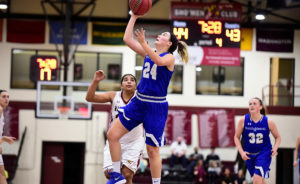 Sophomore Kristin Hamill was honored with the Centennial Conference Player of the Week for the first week in January after recording a career-high 24 points in the Diplomats’ 76-55 win against Alvernia on January 5. Hamill has consistently been a strong force in the team’s offense by averaging 16 points at the time of writing and most notably scoring 20 or more points on six different occasions. Another team leader is junior Haley Pilone who at the time of writing averages around 18 points per game. One of Pilone’s notable performances includes scoring 25 points against McDaniel in an extremely close 67-64 loss on December 9. Additionally, Pilone garnered 29 points in both the Diplomats’ wins against Washington College on January 11 and Swarthmore on January 23. At the time of writing, the Diplomats hold a 5-8 Conference record and sit in eighth place. However, there’s an opportunity for the Diplomats to leapfrog Ursinus if they win their next game against the Bears on January 31st. The team’s last game against Ursinus was a hotly contested 59-56 win on November 28th. This next game on Wednesday is sure to be competitive as both teams are striving for a place in the playoffs. The Diplomats’ regular season closes out in February. To earn a playoff spot, the team needs to end in the top five of the Centennial Conference. With seven conference games left, there is no shortage of opportunities for the team to be successful in earning a playoff spot. Make sure to head out to Mayser Gymnasium to support the Diplomats in their last three home games of the season and in their quest towards the playoffs. First-year Anna Goorevich is the Op-Eds Editor. Her email is agoorevi@fandm.edu.